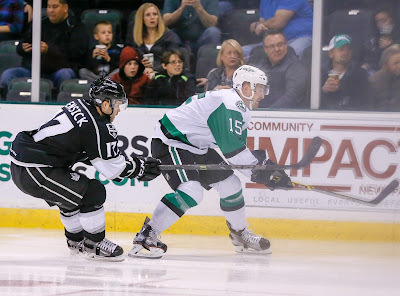 With several key veterans out of the lineup, the Texas Stars emptied the tank against San Diego and came up short in the final period. The four-goal frame for San Diego pushed them past the Stars by a 6-3 final to close Texas's 2017 campaign. "We had good energy in the game, but we have a depleted lineup," said Laxdal. "And that's the fullest they've been all year." Brian Flynn, Justin Dowling, Brent Regner and Niklas Hansson were all absent from tonight's game, putting young players in big minute situations, especially on the power play. Texas did manage to score a goal with the man advantage but had seven opportunities and couldn't get any more. "I thought we forced it," Laxdal said of the power play and offensive play in general. The game really hinged on a 5-on-3 advantage Texas earned early in the third period. Trailing by a goal, the Stars took a timeout to strategize. They got everything they needed, loading up Greg Rallo on the left wing dot for the best chance of the power play. "We tried to make a play, and Rallo fell down and turned it over. It was a key point in the game. If we get it back to 3-3, it turns the game there. That was the difference in the game." There were plenty of other power play opportunities but the personnel were newer to the units. Shane Hanna and Gavin Bayreuther both checked in, for example. San Diego got things started in the first with a power play goal of their own. Texas was outshot in the first period heavily, at one point trailing 10-3. "The times we were successful was when we were throwing pucks and bodies to the net," diagnosed Sheldon Dries. "When we got to that fancy games, things kind of swung in their favor." Denis Gurianov answered on a cram play at the net to make it 1-1 toward the end of the second. NHL vet Eric Fehr wasted no time regaining the lead for San Diego just 45 seconds later and Nic Kerdiles extended the lead to open the third period. Sheldon Dries got Texas back within one, setting up the aforementioned chance to tie on the 5-on-3 just a few minutes later. It was a rough second call for San Diego as Brian Cooper lifted the puck out of play to the right of Landon Bow, but from his own zone. The Stars missed on the chance to tie and gave up two more in quick succession, including Eric Fehr's second of the night. This one came on the power play. The Gulls would find the empty net late but Texas got one more for good measure. It was a solid reward of a goal for Tommy Thompson, who was recalled yesterday and played in his first game on an AHL contract this evening. "I thought Tommy was really good," noted Laxdal. "He's played really well tonight, a lot of poise with the puck and going to hard areas. It's good to see him rewarded." Landon Bow took the loss with 28 saves on 33 shots. Kevin Boyle got the win for the Gulls, stopping 33 of 36. The Stars get a quick chance for redemption next week as the Gulls stay in town to face off with Texas again on Wednesday. Mike McKenna got his second start in a week and was tremendous for the Stars in defeat, allowing a single goal in overtime. It was a goaltending duel between McKenna and rookie Rampage Ville Husso that ended in a 1-0 score. Fellow rookie Dominic Toninato ended the contest with his sixth goal of the season, of course assisted by Star-killer Rocco Grimaldi. Greg Rallo checked into the lineup for the first time since November 10th. He was able to slide into the lineup with the veteran rule after Brian Flynn was injured in Wednesday's game and did not play tonight. Rallo had no points or shots in the contest against his former club. The Texas power play, which has been an engine for its offensive machine recently, didn't get many chances with an 0-for-3 effort. The PK stopped two San Antonio chances. Texas plays again tomorrow night at home against San Diego. Dallas has recalled Jason Dickinson to the NHL ahead of the club's game tonight against St. Louis. Texas plays San Antonio this evening in the Alamo City. Dickinson, 22, has appeared in five games with Dallas this season registering four shots and four penalty minutes. In 24 games played with Texas this season, he has produced 16 points (13-3=16) and and his 13 goals are second on the team. 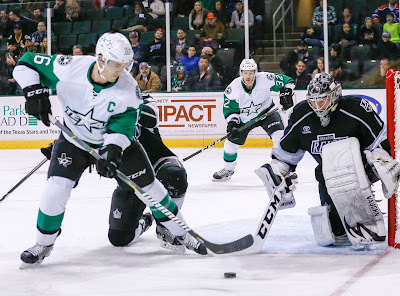 On a night to remember for long-time Star and former captain Travis Morin, the Texas Stars mounted an impressive comeback against their division rival San Antonio Rampage, but lost in overtime 5-4. Morin recorded his 499th and 500th career AHL points with two assists on Curtis McKenzie goals and became the 92nd player to accomplish such a feat. McKenzie finished the night with a hat trick. Landon Bow got the start for the Stars and finished with 25 saves on 30 shots. 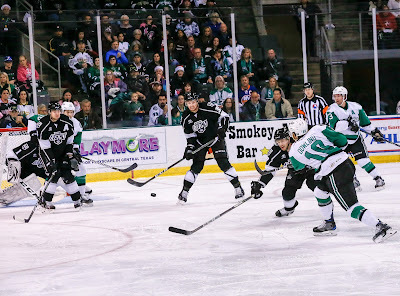 The Stars were offensively dominant in the first period, outshooting the Rampage to the tune of 14-7 but went into first intermission without anything to show for it. Former Texas Star Brandon Ranford created a 2-on-1 rush with Dominic Toninato, and Ranford's shot gerneated a rebound for Toninato to put it past Bow. To make matters more challenging for the Stars, Brian Flynn, currently on a goal scoring hot streak, took a hard fall to the ice after being checked into the boards. He went to the locker room and did not return for the rest of the game. The power play unit for the Stars continued to make strides towards greatness as the Stars have picked up 21 power play goals in the last 21 games and are currently ranked 8th in the AHL. Morin helped the cause with his two assists to McKenzie's two power play goals. The first goal came in the first minute of the second period on a wraparound. The second was in the third period to pull the Stars within one. 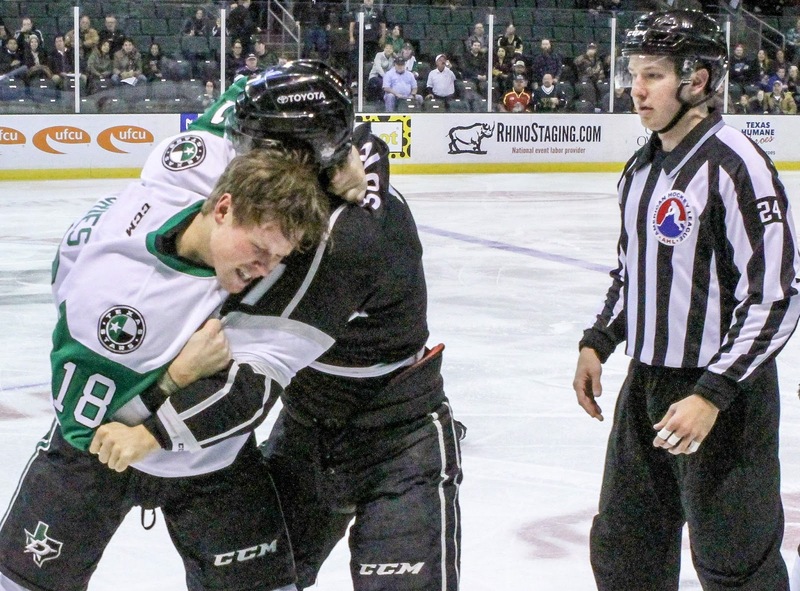 Things took an unfortunate turn for the Stars when they were called for multiple infractions in the period after a clean first period with the Rampage earning 33 seconds of a 5-on-3. Nicholas Miloche gave the Rampage the lead again with a one timer after the first penalty expired. Ranford and Toninato both tallied another point as they picked up the assists. With less than a minute left in the middle frame, Rocco Grimaldi gave the Rampage a two goal lead with a wraparound goal on another power play. The Stars didn't have much time to bask in Morin's milestone in the third period. They turned it over behind their blue line, and Alex Belzile gathered the puck and beat Bow to push their lead back to two. Determined to give Morin their all, the Stars turned it up in the final three minutes of play scoring back-to-back goals to tie the game. Gavin Bayreuther scored first from the point, and McKenzie had the equalizer to complete the hat trick. McKenzie almost sealed the game with a breakaway on the first shift, but Martin stopped him cold. Sheldon Dries took a high stick that went uncalled, and Grimaldi scored his second goal of the night to put a damper on Morin's historic night. The Texas Stars square off against the San Antonio Rampage again on Friday, December 29th in San Antonio. The puck drops at 7:30 CST. Texas secured second place in the Pacific Division at the Christmas break with another overtime victory in Bakersfield this evening. The Stars are now 7-1 in OT this season. Brian Flynn continued to quietly contribute to the offense with two goals, including the game winner. Mike McKenna got his first start since December 1st and won with 29 stops. Texas opened the scoring on a deflection goal that Matt Mangene, playing at defense, got credit for. Iiro Pakarinen evened things up on the power play to start the second. The Stars scored two more of their own on the power play, first Flynn then Denis Gurianov to vault ahead 3-1. The Condors would cut the lead to one with a Kyle Platzer goal late in the second. Joey LaLeggia guaranteed a point for the Condors late in the third with a tying goal, sending it to overtime. The Stars had the only shot of the overtime period, a goal off the stick of Flynn. It was his 10th goal of the year. Texas now returns back to Cedar Park for the Christmas break and will next be in action on Wednesday against the Rampage. Texas faces off against the bottom team in the Pacific division, but they're no pushovers. 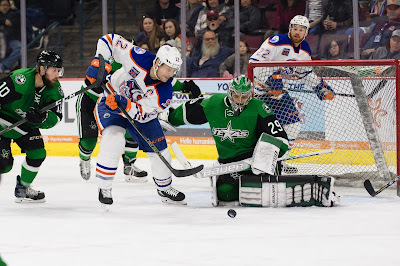 The Condors have claimed 3 of a possible four points against Texas so far this season and have the best record of any last-in-the-division team in the league, just one game back form .500. It speaks to the strength (again) of the Pacific division this year. Texas is lucky to be toward the top of the pack this season. The same was true last year but Texas found itself on the outside at the end of the season. The Condors come in hot off a 4-3 shootout victory over the same Barracuda squad that Texas played last night. They have been alternating wins and losses pretty consistently for the last month. A four-game losing streak against Tucson and Stockton in mid-November is really the only difference between this team and a better than .500 record. Texas has stumbled a bit in their recent going. Of course, saying that acknowledges how insanely well they have done over the past twenty games or so. In their last four, they are 1-2-1, but before that, they were 11-3, which has moved then from one below .500 to 6 ahead. Look for McKenna to get a start tonight with Bow getting his starts in the last two games in three nights. The Texas Stars had an opportunity to seize control of the Pacific division as the Tucson Roadrunners lost to the Stockton Heat but failed to capitalize against the San Jose Barracuda, losing 3-1. Antoine Bibeau had a sparkling start in net for the Barracuda and finished with 29 saves on 30 shots. 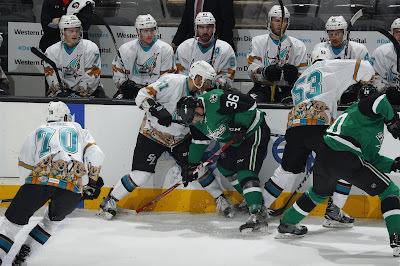 The Barracuda struck first and forced the Stars to chase the rest of the game when Reece Scarlett was called for holding, giving San Jose their first power play. After an initial shot from the point, Barracuda captain John McCarthy had two opportunities in front of the net, and Landon Bow couldn't make the third save. Bow finished the game with 26 saves on 28 shots. Recently called up from the ECHL, Emerson Clark drilled Scarlett with a cheap shot in the back that drew a five minute boarding penalty and the ire of Denis Gurianov. The Russian winger stepped in at the end of the play for a round of fisticuffs with Clark. The fourth ranked penalty kill unit for the Barracuda showed its mettle and left the Stars with only a couple of shots on goal. The Stars were outshot heavily in the first period 14-4. The tough sledding continued for the Stars in the second period. Dillon Heatherington couldn't avoid the forecheck in front of his net, and he turned the puck over leading to a goal from Brandon Bollig. 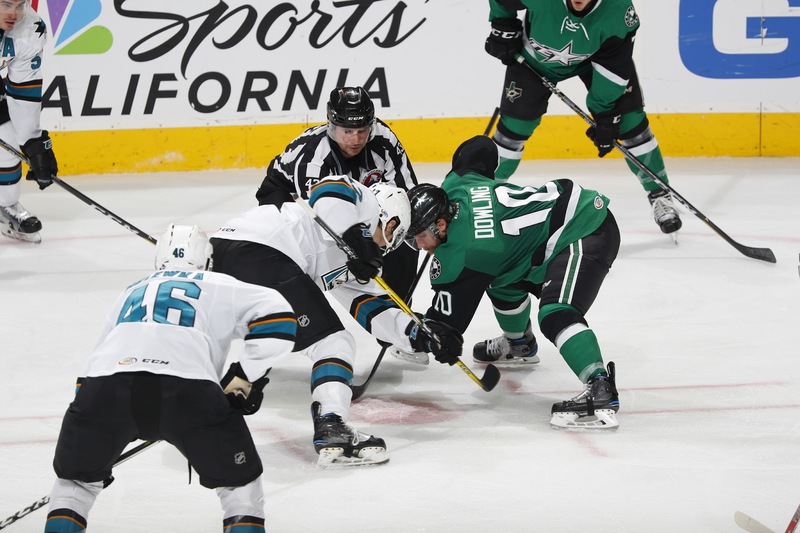 San Jose goaltender Anoine Bibeau had a shutout in his sights as the game was headed for the second intermission until the Stars finally found some offense. Curtis McKenzie and Justin Dowling came in hard on the forecheck and set up Brian Flynn with a one timer in the slot. It was Flynn's eighth goal of the season. Texas was the better team in the third period, but Bibeau was the best player on the ice. Sheldon Dries set up Gurianov early in the third period for a one timer that caught Bibeau's glove. Gurianov later made Bibeau stand on his head with another chance from in close. Flynn hit a crossbar as he almost notched his second goal of the game. The door was closed on the Stars comeback when Brandon Mashinter scored an empty net goal with about a minute left. The Stars will conclude their California road trip on Saturday, December 23rd against the Bakersfield Condors. The puck drops at 9:00 CST. Cole Ully has been reassigned to the Idaho Steelheads. Ully has only appeared in 16 games this season with Texas, tallying just three assists. The Texas Stars, American Hockey League affiliate of the NHL’s Dallas Stars, announced today that forward Cole Ully has been reassigned to the team’s ECHL affiliate, the Idaho Steelheads. Ully, 22, has appeared in 16 games for Texas this season with three assists. The 6-foot, 170-pound forward has appeared in 120 games for Texas in his career and registered 45 points (20-25=45). The Calgary, Alberta native is a former fifth-round pick of Dallas in the 2013 NHL Entry Draft. 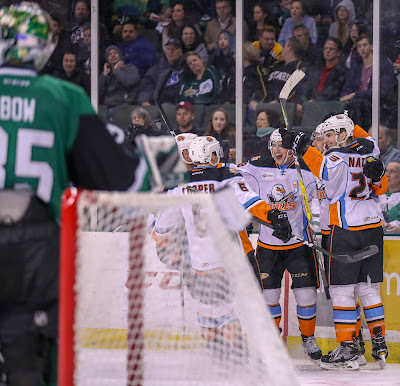 Coming off a disappointing loss in overtime to the Ontario Reign on Wednesday night, the Texas Stars will continue their California road trip as they match up with the San Jose Barracuda for the third time this season. The first of their previous two meetings resulted in a 3-2 shootout victory for the Stars in Cedar Park. In the second meeting, the Stars were pasted to the tune of 6-1 in San Jose. The Stars need a better showing to push for their bid for first place in the Pacific division, especially on the first game of a back-to-back. The Barracuda are in sixth place in the Pacific, though they've played decent hockey in their last 10 games with a 6-4-0 record. They don't currently possess any point per game players and rely on balanced scoring throughout their lineup. Rookie winger Rudolfs Balcers leads the team in scoring with 19 points. Antoine Bibeau splits time with Troy Grosenick in net, with the former having the better showing of the two this season with a .916 SV%. The Barracuda are slightly below average on the power play but do possess the 4th best penalty kill in the AHL. They are coming off a 3-2 home victory against the Bakersfield Condors, whom the Stars will see on Saturday. 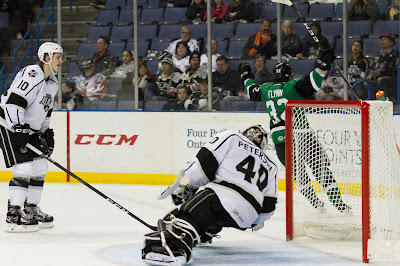 Against the Ontario Reign on Wednesday night, the Stars scored one goal on the power play, penalty kill, and even strength each. Though he didn't score in the last game, Roope Hintz had his share of chances, including one that hit a crossbar. He will be a player to watch, along with his winger Denis Gurianov who had a quite game in Ontario. Landon Bow didn't have his best outing, but figures to draw the start in San Jose with Mike McKenna playing in the second game of the back-to-back against Bakersfield. Leading the team with six power play goals, Curtis McKenzie will have his work cut out for him against the best penalty kill team he and the Stars have seen in a while. Just a quick hit to talk about the success of the local Chaparral ice teams at the Silver Stick Tournament in Maryland recently. Here are the full stats. Contact the Chaparral Ice if you have any interest in helping these teams pay travel costs to make it to Canada. Winners of 9 of their last 11 games, the Stars took a radiant 6-0-0 overtime record into Ontario only to have it blemished as the Reign came out on top 4-3. The Stars had the edge on special teams, going 1-for-4 on the power play and 3-for-3 on the penalty kill. They also scored in a myriad of ways--one goal at even strength, one on the power play, and one shorthanded. It wasn't enough to overcome the Reign who had an answer for everything in this game. Rookie goaltender Cal Petersen got the start for the Ontario Reign, and the Stars had him scrambling for saves in the first period. Samuel Laberge and Jonathan Racine dropped the gloves for a spirited bout to give the two five minute fighting penalties. Both teams recorded seven shots on goal at the first intermission. Andrew Bodnarchuk opened the scoring and got his third goal of the season in remarkable fashion. Fifteen seconds into the second period, he fired a shot from the point that sailed wide of the net, deflected off the end glass, and bounced off of Petersen's back into the net. Then the Reign's physical forecheck started to give the Stars issues. The Reign tied the game shortly after the Bodnarchuk goal when the Stars turned the puck over in their zone and set up a 2-on-1 situation for the Reign. Mike Amadio, who had four points against the Stars this season, had the initial shot, and Austin Wagner cleaned up the rebound. Another turnover late in the period gave Andrew Crescenzi all day to wait out Landon Bow and wrap the puck around the net to put the Reign up 2-1. Bow finished the game with 21 saves on 25 shots. Texas needed some kind of shot in the arm to take them into the locker room and got it from Brian Flynn and Jason Dickinson. The Stars took their second penalty of the game, and Dickinson broke out of the defensive zone, narrowly avoiding a body check, and centered to Brian Flynn who was all alone in front of Ontario's net. It was the Stars' fourth shorthanded goal of the season. Bow made three successive saves early in the third period to keep the game even. Seizing a golden opportunity on the power play, Justin Dowling shot a puck through traffic that Petersen never got a bead on and gave the Stars the lead. With six minutes to go, the Stars allowed a tough goal as Cory Ward got just enough of a desperation centering pass to tip the puck in and tie the game at three. Ontario winger Justin Auger was left unchecked in the overtime frame after the Stars turned the puck over and he beat Bow easily to win the game. The Stars continue their road trip through the Golden State and will square off with the San Jose Barracuda on December 22nd at 9:00 PM CST. 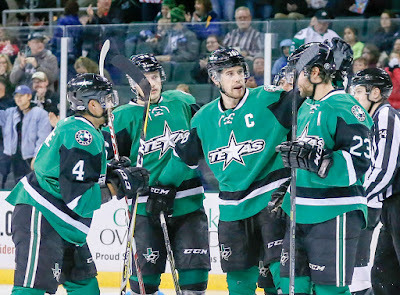 First place in the Pacific division suddenly seems a very realistic goal for the ascending Texas Stars. If they can maintain their current .625 win percentage while waiting on the first place Tucson Roadrunners to catch up to them in games played, the Stars will likely be sitting pretty when the playoffs roll around. Awaiting them in Southern California is a team in the Ontario Reign that bludgeoned them with their size and physicality in their two meetings last week in Cedar Park. The Stars managed to get the split against the Reign whose recent play isn't indicative of their record. Recording 29 saves on 31 shots last Wednesday in his first victory back in Cedar Park, former Star Jack Campbell got the start for the Reign in the crease. He has had a solid statistical season (.923 SV%) and figures to draw another start against his former club. Defenseman Kevin Gravel and center Mike Amadio both recorded three points in the two games against the Stars last week. On the wing, Michael Mersch remains Ontario's top scorer with 20 points on the season. The Reign currently sit at 14th in the AHL on the power play and 22nd on the penalty kill. Look for the Stars to take advantage when they draw a penalty. The Stars are coming off a thrilling overtime victory against the Cleveland Monsters in which rookie Niklas Hansson scored his first AHL goal--the overtime winner. They won't be afraid to take the Reign to overtime as they currently sport a perfect 6-0-0 record in extended play. Shane Hanna was called up from the Idaho Steelheads to start for the injured Brent Regner and recorded his first point with an assist. Jason Dickinson's flight did not land in time for him to play against Cleveland, but he made the trip to Ontario and will slot back in the lineup--a huge boon for the Stars. Landon Bow is currently carrying all the water in net for the Stars and that will likely continue on Wednesday night. Tommy Thompson has signed an AHL contract for the remainder of 2017-18 with Texas. His strong play in Idaho has shown he can be a depth call-up for Texas in the future. Texas likely wanted to make sure he wasn't snatched up by any other AHL team looking for a PTO forward. 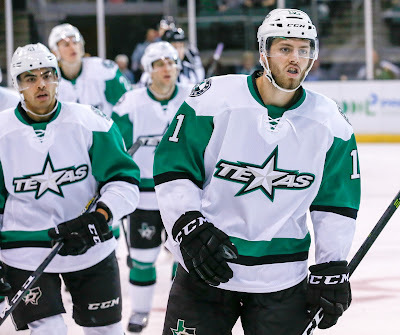 The Texas Stars, American Hockey League affiliate of the NHL’s Dallas Stars, announced Tuesday the team has signed forward Tommy Thompson to an AHL contract for the 2017-18 season. Thompson, 27, has appeared in eight games this season for Texas and tallied two assists. 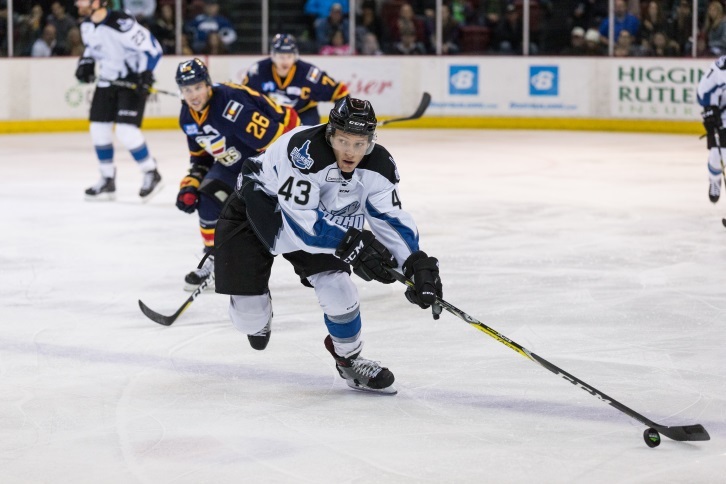 The 6-foot-1, 195-pound forward has appeared in nine games this with the Stars’ ECHL affiliate, the Idaho Steelheads, registering seven points (2-5=7). The Saratoga, N.Y. native is currently in his second full professional season out of St. Lawrence University. Thompson will continue to remain with the Steelheads. A couple of rookies helped the Texas Stars claim the victory in overtime over the Cleveland Monsters 5-4. Shane Hanna, who was called up from the Idaho Steelheads on Thursday and made his AHL debut in place of the ailing Brent Regner, collected his first AHL point on an assist. Niklas Hansson scored his first AHL goal in heroic fashion in the overtime frame. Landon Bow got the start in net for the Stars and finished with 40 saves on 44 shots. The Stars won the war, but lost the special teams battle as they went 3-for-5 on the penalty kill. Sam Vigneault, who finished the game with two goals, scored his fifth goal of the year within the first five minutes of the game as he had a point blank chance in front of Bow. Denis Gurianov helped Roope Hintz knot the game up when he threw a puck in front of the net. The puck took a few bounces before Hintz buried it in the midst of a front net scramble. Hanna had the secondary assist on the goal to record his first point in the AHL. The teams traded penalties, and Nick Moutrey for the Flyers scored on the Cleveland power play when the puck caromed off of Dillon Heatherington's skate and into the net. Sheldon Dries went on the forecheck in the second period and forced a turnover behind the Monsters net. He centered to Mark McNeill, who finished off the play with a beautiful one timer that tied the game at two. McNeill later committed a five minute major penalty when the Stars were on the power play to send the game to 4-on-4. Things took a strange turn and the Stars drew a minor penalty a few seconds into their penalty kill. The shorthanded hockey carried over into the third period. During some more 4-on-4 action, the puck took a fortunate bounce for the Stars in the third period and glanced off of Monsters goaltender Matiss Kivlenieks' skate. Bodnarchuk, who was on the forecheck, was credited for the goal. Andre Benoit beat Bow cleanly in a high corner as Bow was being screened. On the very next shift, the Stars drew a delayed penalty and Matt Mangene caught the Monsters flat-footed as he sneaked in close to the net for a goal that put the Stars up 4-3. The Stars went on the penalty kill with a few minutes left in the game and couldn't hold the lead. Vigneault went to the front of the net and was rewarded with his second goal. Monsters leading scorer Carter Camper had the assist. Overtime featured a competitive goaltender duel for the first three minutes. Kivlenieks held his own for the Monsters until the Stars created an odd-man rush that was too much to overcome, and the rookie Hansson won the game. The Stars will head for the west coast next week and play against the Ontario Reign on December 20th at 9:00 PM CST. UPDATE: Jason Dickinson has been reassigned to the Texas Stars. 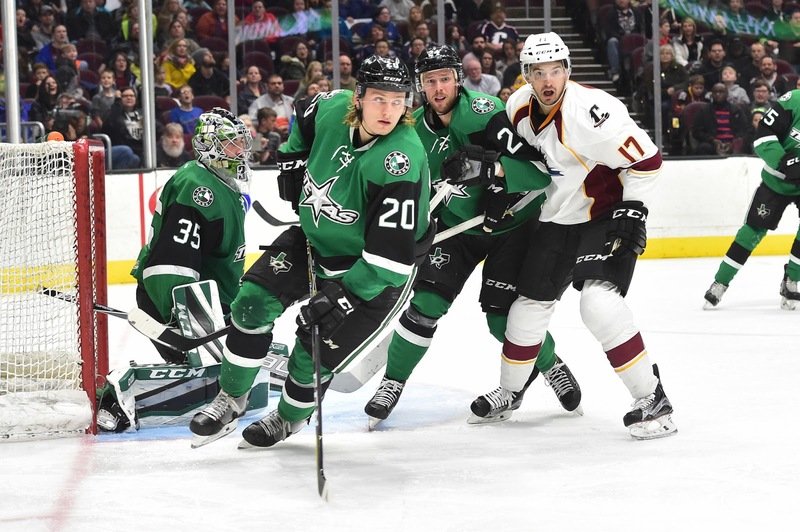 The last time the Texas Stars squared off against the Cleveland Monsters, the two teams appeared to be superficially similar in trajectory in their respective divisions. Though it was late November, it seemed like an eternity ago. In terms of the playoff picture, the Monsters are on the outside looking in with a 3-7 record in their last 10 games, including two losses against the Stars. By comparison, the Stars are looking to continue to rise in the standings and improve upon their 8-2 record in their last 10. A huge reason the Stars are playing well of late is their power play, which was stuck in the mud early in the season. Lately they've managed to tow it out of the ditch to bring bring their season power play percentage to about average. They'll have to keep it clicking without Jason Dickinson, as he is still helping the Dallas Stars deal with their various nicks and bruises to forwards on their four game road trip. Greg Rallo and Brent Regner are also nursing injuries of their own. Regner is possible for tonight, but Rallo is unlikely. Seeing that he has grabbed the number one slot over the past month, this is likely a Landon Bow game. Though they'll be without Dickinson, long time Texas Star and former captain Travis Morin has drawn into the top three in AHL scoring. Look for him to carry the water, along with Curtis McKenzie and Roope Hintz. Recently called up from the Idaho Steelheads, Shane Hanna may slot in but is likely to be the 7th defenseman with Mangene sliding back to defense as he did on Wednesday. The Stars have had post-game open skate in the past, but this weekend the team will kick off a partnership with Austin's local public rink, Chaparral Ice, to provide skate rentals for those who don't own their own skates. Eight dates are on the calendar for this post-game rental and skating opportunity. Rentals will run just $5. With Brent Regner injured and only possibly in the lineup on Saturday, Texas has called for defensive backup. Shane Hanna has been having a fantastic run of games, notching a multi-point game last week and compiling 4-10=14 in 26 games so far. The Texas Stars, American Hockey League affiliate of the NHL’s Dallas Stars, announced Thursday the team has recalled defenseman Shane Hanna from their ECHL affiliate, the Idaho Steelheads. Hanna, 23, has appeared in 26 games this year with Idaho, tallying 14 points (4-10=14). The Salmon Arm, British Columbia native spent the last four years at Michigan Tech prior to beginning his pro career, and appeared in 163 collegiate games during his four-year stint. The 5-foot-11, 200-pound rookie began the season in NHL and AHL training camp with the Dallas Stars and Texas. Sheldon Dries scraps in the first period. 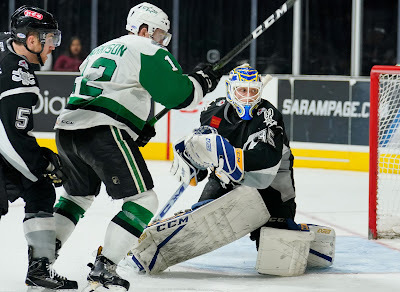 Texas got a solid effort this evening in the second game of a two-game set with the Ontario Reign, but ultimately could not capitalize on a massive number of penalties taken by the visitors. "If the effort wasn't good and we lost, we'd be disappointed," said Coach Laxdal. "We tried to play with more pace and stay out of the stuff after the whistle. It was a heavy game. They had a game plan to come in here and be physical against us." The Reign shifted their lineup to add more heft, and it weighed on the Stars. Texas did get pulled into some after-the-whistle stuff but mostly stayed on the right side of the law. For the power play unit, it wasn't a lack of execution, it was in large part a great game from former Star Jack Campbell in net. "If they're going to play physical and take penalties, their penalty kill has to be at the top of their game and their best penalty killer tonight was their goaltender." Campbell collected his first win back at the H-E-B Center not in a Stars' uniform with 29 saves on 31 shots. Texas did pierce his armor twice though, both on the power play. Early, Texas got a nice setup for a left-wing circle shot from Mark McNeill. The 5-on-3 PPG was his fourth goal of the year and set the score at 1-0. "We just stuck with it," said McNeill of the power play's recent resurgence. "We're focusing on bearing down when we get out there. I don't think any of us are satisfied with where we're at." Paul LaDue tied things up on the power play for Ontario and took it to the second with that scoreline. Texas got a power play goal from Curtis McKenzie, his 11th goal of the season, to push it back to a one-goal lead. Coach Laxdal noted that Texas had a number of opportunities to go up 3-1 but couldn't salt it away on the power play or at even strength. The Stars even had 91 seconds of 5-on-3 that came up empty. Ontario "hung around" and got an even-strength tally, the only one of the night, to close the second. Laxdal said that goal "stung" the team. With the score tied, Texas hit the third period and gave up a power play goal to Kevin Gravel middle of the period. Earning a late power play, Texas couldn't capitalize there or with the extra attacker, giving up an empty net goal for the 4-2 final. Overall, Texas can't be too disappointed with the loss. The L brings them to 8-2 in their last ten, a respectable record by any stretch of the imagination. Things were working for the Stars tonight on special teams and while there were some things to clean up, a copy-paste effort on Saturday night could just as easily net them two points. This game is a learning moment for the younger, speedier players in what to do when faced with a physical club. Laxdal called out letting the puck do the work in these types of games as the Reign worked to take away the speed and hands of the Stars. Texas gets back to it on Saturday night against Cleveland. Brent Regner was out tonight with an upper body injury, and Laxdal noted the club missed his steadying presence on the backend. He could play Saturday. 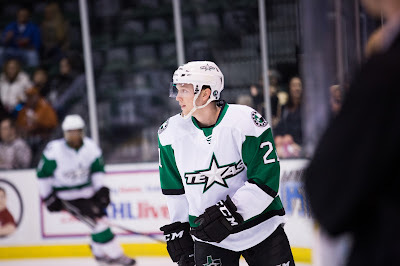 What can be said at this point about the Texas Stars? Everything is going right for them as they hit mid-December. On an 8-1 streak that could push them to 2nd in the division this evening with another win, they're riding very high. One of the big things that has turned around for Texas is the power play. The Stars are ranked 14th in the league, which is a fair spot to be in any context. However, the club was in last place before their November road trip. Last place. While Texas was idle, the Reign got back to .500 hockey with a win in overtime against the Rampage on Sunday afternoon. Cal Petersen got the start, stopping 37 of 39. Texas expects Austin Fyten to check back into the lineup tonight. 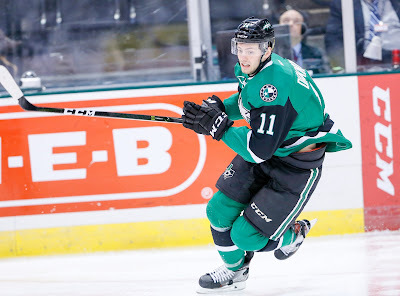 Fresh off a two-goal performance last night, the Texas Stars have recalled Jason Dickinson from the Texas Stars. Details below. The Texas Stars keep finding ways to win in every situation as they topped the visiting Ontario Reign 4-2 on the back of a three-goal third period. "The mentality is doing whatever we can," said Justin Dowling, who scored the opening goal tonight. "These points at the beginning of the year are huge. All these points before Christmas, at the end, teams that make it or don't, it's as close as one or two points." Ontario plays a big, heavy game that flies in the face of Texas's speed-based strategy. Tonight, Texas got the best of the Reign. "They're pretty good in the neutral zone, so it's hard to get our feet going and play with speed when they're almost trapping us. We just have to adjust our game plan a bit." Strong play from the fourth line and the power play were the differences tonight. The difference in speed vs. size was no better demonstrated than on the game-winning goal. Colin Markison, noted by Coach Laxdal for his speed all season, beared down on a Reign defender to generate a turnover and send the puck to the net for a deflection goal by Samuel Laberge. "[Markison] plays in the identity of our club," said Laxdal. "He puts a lot of pressure on you with that speed and puts you in a bad spot and he put the young defenseman Walker in a bad spot with that speed there on the third goal." The power play opened up the evening's scoring on a 5-on-3 early. Dowling, who scored the goal, pointed out that it's sometimes difficult to get a power play so early when "you don't have a feel for the game or too many touches on the puck." Regardless, a misplay of a clear by Ontario came back on them for the 1-0 Stars lead. In the second, Michael Mersch scored on the power play to even things up, just a few seconds after a rather light interference penalty call on Andrew Bodnarchuk. Matt Moulson, playing in the AHL for the first time since 2009, had the primary assist. Immediately off a faceoff early in the third, Ontario took the lead. While the goal could have put Texas back on its heels and pointed to a loss, that has not been in the team's DNA over the last ten games. The Stars roared back with a power play goal off a backhand from Jason Dickinson. On the very next shift, Markison assisted Laberge for the aforementioned forecheck goal, and the momentum had shifted completely. The Reign would have some chances but wouldn't seriously threaten for the rest of the night. "We're getting good contributions from everybody right now. We're trying to balance our lineup. [Our fourth liners] are doing their job. They're defensively responsible and they're chipping in points as well." The Reign pulled Jack Campbell perhaps a bit too early, as Texas was gaining possession as he left the ice. Jason Dickinson salted the game away with his second of the night and 13th of the year, an empty netter. Travis Morin picked up the assist, his second of the game and 28th point overall. He is currently 4th in the league in scoring. Texas will take tomorrow off and go light on Monday as they look to recover from a long road trip and three quick home games. They're in action against Ontario again on Wednesday. Coach Laxdal called tonight's game Gurianov's best of the year without the puck, indicating improvements in his defensive game. Texas suits up against Ontario for the first time this season tonight. Texas and the Reign have both been having decent success over the last stint of games. Texas is 7-1 over their last eight while Ontario is 5-3 over the same span. The difference in the records is heavily biased toward how each team started the season. While Texas came out of the gate with three wins, Ontario nearly exited the month of October without a W, a span of six regulation losses to start the year. Since that point, they are 9-3-0-1. A quick look at the score lines indicates that Reign hockey is alive and well. Several of the games that helped the club get back on track were shutouts. Several more saw only one goal allowed. Former Texas Star Jack Campbell (5-4-1, 2.23, .930) is the starter in Ontario and looks to the starter tonight. Backup Cal Petersen is a rookie and has looked just as formidable as Campbell early (4-5, 1.99, .926). Up front, Michael Mersch still leads the way. The former AHL Rookie of the Year leads in both goals and points (7-9=16). Rookie Matt Luff is dangerous on the wing with 4-8=12. Another notable includes recent addition Jordan Subban, brother to P.K. and Malcolm, who was just traded from Vancouver. He has 16 games under his belt in Utica but tonight's could be his first in the Kings org. Texas is having a fantastic run itself right now and gets to add Curtis McKenzie back to the lineup tonight. Coach Laxdal indicated that would shuffle the lines a bit, putting Brian Flynn back on a line with Roope Hintz and Denis Gurianov. The team agreed that it wasn't their best game this season. However, the Texas Stars are finding ways to win those games now, and that's a huge improvement. The tight 3-2 overtime win may have lacked energy, but "a win is a win." "We're finding ways to win," said Coach Derek Laxdal. "We'll take any win. Was it our best game? No. Did we get the two points? Yes." Sheldon Dries stood out again this evening. After scoring two on Tuesday, he netted the overtime winner late in the five-minute frame. It wouldn't be exaggeration to call it one of the top three prettiest goals this season. "I didn't want to turn it over," said Dries. "So I figured if I could do a little spin-o-rama move to keep possession and turn it to the corner that would be fine for the team. I got through though." Dries turned Kyle Platzer inside out with the move and had a clean chance at Eddie Pasquale. The goalie stopped the first shot but couldn't get the rebound. It was a sleepy game in many ways until that moment. Penalties going both ways slowed down the progress of the contest. The two clubs finished combined 0/10 on the power play. "Once you start taking that many penalties you start to zap the energy of the group," said Laxdal. "We took the energy out of our game with four or five minors in the first and second period. They did a really good job on the penalty kill. They had a four minute kill and we didn't generate much on it." Brad Malone opened the scoring for the Condors, but Jason Dickinson literally helped Texas bounce back. Brent Regner's initial shot deflected up and bounced into the net off Dickinson's shoulder. Denis Gurianov scored his second goal of the year on a backhand move off the rush in the second. It gave Texas a 2-1 lead. "It was good to see Denis score a goal off the rush. A backhand is a harder shot to stop than you think. You can't tell when it comes off the stick." Roope Hintz and Gurianov have been paired together to get speed into the lineup. Hintz is feeling good about the combination, "We need to use our speed and work from that. We can get scoring chances from that. Sometimes we find each other and get some good chances." The Stars gave up a soft goal early in the third as Iiro Pakarinen slid the puck in on a lazy wraparound. Bow hadn't sealed the post, and it was 2-2. Texas couldn't make anything out of a late 4-minute power play and took it to OT. Dries performed his aforementioned heroics late in the frame as he was looking to change. In fact, Travis Morin got an assist on the goal but wasn't even on the ice for the goal. He had already changed by the time Dries scored. Aside from the soft goal, Landon Bow had a solid game and his quietness of play continues. He stopped 35 of 37. Texas plays Ontario tomorrow at home. Texas had a busy day on the transaction wire. Here's the breakdown. First, forward Austin Fyten has been recalled from the ECHL. He was injured in the early season and only played one game in Texas. After some conditioning in Idaho, he's back with the AHL club. Second, as a result of regaining Fyten, Tommy Thompson has been released from his PTO. He will return to Idaho. Third, Mike McKenna has been reassigned to Texas. He backed up last night for Dallas against St. Louis. Ben Bishop is back to health, so McKenna can return. Finally, Curtis McKenzie has also been assigned back to the Texas Stars. With Ben Bishop out with a sore back, the Dallas Stars have recalled goalie Mike McKenna ahead of tonight's game against St. Louis. McKenna has been recalled once before this season but did not play. 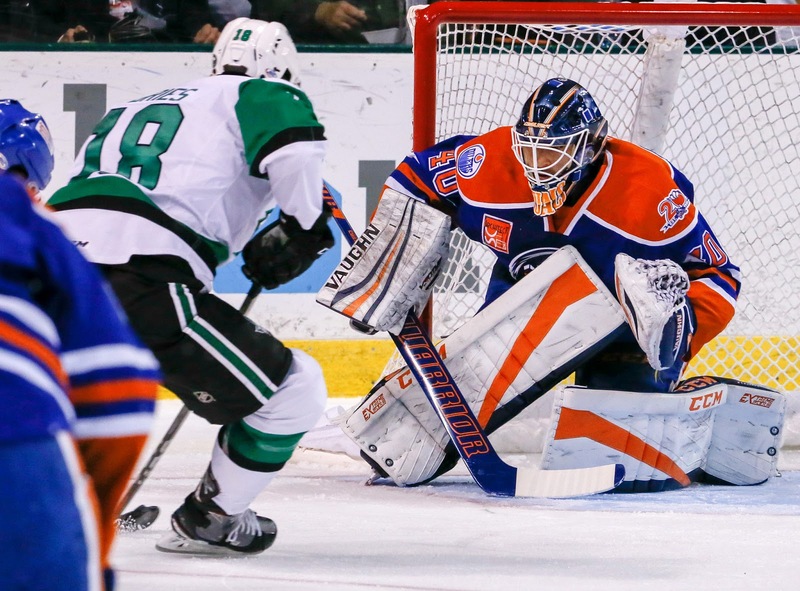 Dallas Stars General Manager Jim Nill announced today that the club has recalled goaltender Mike McKenna from Texas. McKenna, 34, has appeared in 13 games with Texas during the 2017-18 season, earning a 6-5-1 record with an .871 save percentage and a 3.53 goals against average. It takes a lot of pluck to return home strong after a seven-game road trip. Texas showed it was up to the task this evening, earning another come-from-behind win. This time, it came at home against the Iowa Wild in overtime. "Any time you come off a road trip, that first game back is tough," said Coach Derek Laxdal. "For us to steal two points in our own building when they're sitting here waiting says a lot for us." The Stars traded goals with the Wild through the early second period but went down 4-2 just past halfway through the game. It wasn't unfamiliar territory of late, and Texas had the recipe for the comeback. "Everyone's contributing," noted Sheldon Dries, who contributed two goals himself this evening. "[Falling behind] is not a trend you want to stay on, but it's a good sign for our team that we're able to come back to get the win." Landon Ferraro got the Wild on the board early but Brent Regner tallied his first goal of the season on the power play a few minutes later to tie things up. Travis Morin and Justin Dowling got well-earned assists as their passing opened up a lane for Regner's bar down shot from the point. Iowa jumped ahead again a few minutes later and picked up a power play to boot. It was an oft-derided faceoff violation, and this one was no exception. Sheldon Dries took it diplomatically, "You deal with those. You're not always going to like them. Any penalty against you, I don't think you're going to like." Dries also put his displeasure into action as he broke in alone on Steve Michalek for an unassisted shorthanded tally to tie things up. The Wild responded with two more of their own, a tough goal that came as Texas left perennial threat Pat Cannone all alone out front and a 5-on-3 power play goal. The Stars certainly disagreed with the circumstances of that penalty, but they were determined rather than mopey in their disagreement. Facing the prospect of a two-goal deficit after forty, Texas closed the gap in the final ten seconds of the second period. Sheldon Dries tipped a Dillon Heatherington shot five hole on Michalek to move the score to 4-3. "I'll take them any way they come," he noted. "But the tip is more my style." Laxdal continues to heap praise on the rookie Dries, "What I see in him is a prototypical third line center who can move up and down your lineup and play heavy minutes for us." Texas got chances like Dries's all night, especially in the third. The forward added, "Laxdal is always saying that you've got to stop in front of the net. We had a tendency to drive by. In the [latter half], we were stopping in front more and that created more chances." Brent Regner even got into things, looking like he nearly had a second goal on a drive to the net. There was no stopping involved on Jason Dickinson's tying goal in the third, however. A streaking Dickinson collected a Dowling pass in the slot and beat Michalek for the 4-4 mark. Dowling and Dickinson were paired up as Laxdal shifted lines in the third to give more speed options to the offense. "I thought we gained energy in the third period. Once I made the line changes to put speed with speed, we had good looks on every line." Overtime was quiet to begin as Texas spent a long time with possession, playing keep away in pursuit of a solid shooting lane. When Iowa reclaimed the puck, Jason Dickinson bumped Jason Kloos and it looked like a power play was upcoming for the Wild. However, Dickinson got the interference call and Kloos picked up two for diving. With that lucky break, Texas found the back of the net straight away. Matt Mangene's initial shot bounced to the skate of Travis Morin, who redirected it to his stick and into the net for the 5-4 victory. Landon Bow collected the win with 23 saves on 27 shots. He moves to 8-4 on the season. Texas next plays Bakersfield on Friday at home. Coming off a very successful road trip, the Stars host the Iowa Wild, who are also having good success this season in the Central Division. At three above .500, the Wild are 3rd in the division and come to town having just snatched 3 of 4 points from two games with the Rampage down the road. It has been a marked turnaround for the Wild, who entered the month of November at 2-5-2-0 and now sit at 11-8-3. During that stretch, they went 9-3-1. In the early season, the Wild were scoring enough but they were also letting in too many. Niklas Svedberg started the first 8 games of the season but gave way to Steve Michalek in early November after Svedberg was recalled to Minnesota. Since that point, Michalek has started more games than Svedberg by nearly a 2:1 margin... and he's winning them too. Michalek is 5-1-1 and Svedberg is 6-7-1. Rookie Adam Vay has one decision, an overtime loss. Iowa has some reliable elements up front in Pat Cannone (9-7=16 in 22 GP) and Cal O'Reilly (5-9=14 in 21 GP). Rookie Justin Kloos is a player to watch with 4-8=12 in 22 GP. Also, be on the lookout for defenseman Kyle Quincey. The veteran has struggled this year with Minnesota and was assigned to the AHL yesterday for the first time since 2008. Texas's homestand will take them through the next two weeks and one of the top storylines has to be the emergence of Landon Bow as a legitimate starter in the AHL. The road trip was a huge turning point, and if this team makes the playoffs, this is probably the turning point you look at as saving the season. The Stars did not do so well against Iowa last season (1-3) but have a fantastic record overall against the club extending back to Aeros days (36-25-6-3). Just as quick as he was up, he's back down. Jason Dickinson, who was recalled yesterday, was reassigned back to Texas this afternoon. He did not play in last night's Stars victory over the Avalanche. Dickinson, 22, has appeared in four games with Dallas this season registering two shots and four penalty minutes. In 17 games played with Texas this season, he has produced ten points (9-1=10) and is second on the team with nine goals. With Martin Hanzal going on injured reserve, the Dallas Stars recalled Jason Dickinson this morning from the Texas Stars. Dallas Stars General Manager Jim Nill announced today that the club has recalled forward Jason Dickinson from the Texas Stars, Dallas' top development affiliate in the American Hockey League (AHL), and placed center Martin Hanzal on Injured Reserve (hamstring) retroactive to Nov. 28. 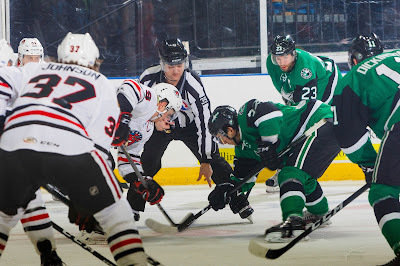 Attempting to win their sixth straight game, the Texas Stars took to the ice against the Rockford IceHogs on Saturday evening to wrap up their lengthy road trip. Making some real headway in the standings, the Stars had won five of their last six, and eight of their last ten. Saturday's game was their first of four meetings against a Rockford team that started the season strong but has been up and down as of late. The Stars were without their captain, Curtis McKenzie, as he was called up early on Saturday to join the nicked up parent club. The Stars got the start they were looking for to stay hot on the road, but things got away from them fast in the second period and it was too much to overcome as Rockford kept their foot on the gas in the third. The IceHog's top scorer Vinnie Hinostroza finished with a goal and two assists, and Anthony Louis notched a goal and an assist. 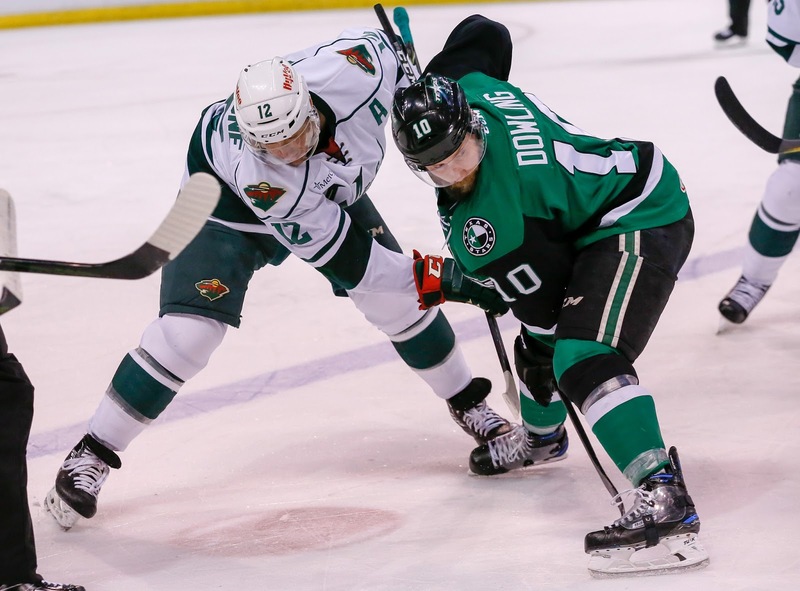 The Stars' offense was mostly stagnant and they only received goals from Roope Hintz and Mark McNeill, who drew into the lineup for a second consecutive game. 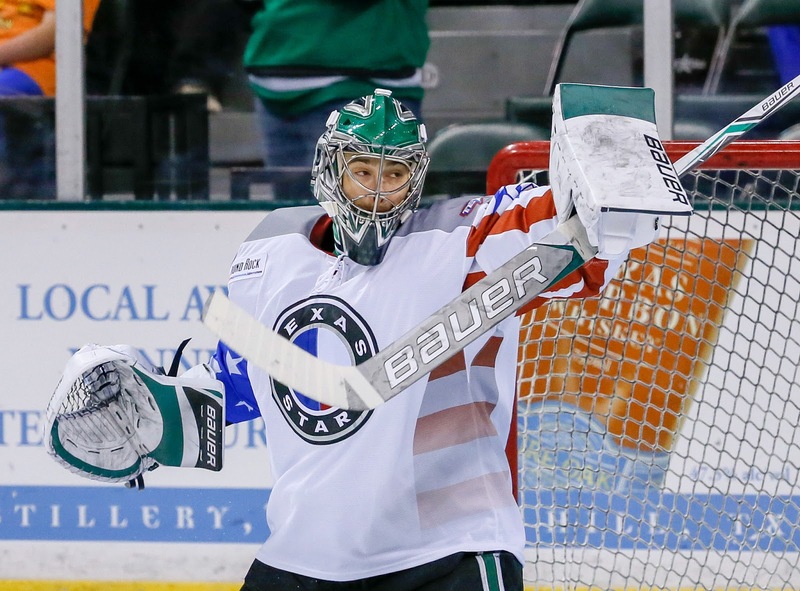 Landon Bow got the starting nod in net for the Stars, and it was paying off early. Hinostroza had an early one timer from the slot that Bow handled admirably. Gavin Bayreuther gave the IceHogs their first power play about five minutes in with a tripping minor. After a successful kill, the Stars countered with shot attempts in the offensive zone that made Rockford goaltender Jeff Glass sweat. Cole Ully was inserted into the Texas lineup and rewarded his team with a power play opportunity as he was tripped up on a 2-on-1 breakaway. Hintz was all alone in the slot and had a chance but was thwarted by Glass. He would not be denied a second time. The teams traded two more power plays in the first period, and the Stars were successful on their second kill, but the IceHogs were not. Hintz found twine with a wrist shot that beat Glass for his eighth goal of the year. He has been scoring at a point per game clip in the last eight. The second period was tough sledding for the road-weary Stars. Hintz was too aggressive in the second period and was called for a hook. The Stars couldn't finish their third consecutive penalty kill, and Anthony Louis beat Bow on the IceHogs' 13th shot of the night. Hinostroza kept rolling for his team and fired a slap shot that Bow got a piece of but had it trickle through his legs. To go along with the assist on the Louis goal, it was Hinostroza's second point of the night to bring his total on the season to 21. Louis wasn't finished for the IceHogs either. He forced a turnover in the neutral zone and found William Pelletier on the rush who finished the play with his second goal of the year. Just like that, the Stars were down by two with little going their way in the offensive zone, though they were outshooting Rockford 20-18. The third period wasn't much kinder to the Stars. They committed an early penalty, but drew one themselves on the penalty kill. During 4-on-4 play, Hinostroza created again for his teammates as his centering feed produced two scoring chances for the IceHogs. The second attempt was finished by Darren Raddysh. Brent Regner gave the IceHogs their fifth power play of the night as he was caught for a hold. Though they killed the penalty, the Stars were eventually buried by a goal from Luc Snuggerud. McNeill finished his goal late in the third period on a helper from Travis Morin, but it was too little too late. The Stars had to empty their net and paid the price as Rockford scored almost immediately. Texas finished the game going 1-for-6 on the penalty kill, but taking that many penalties isn't a recipe for success on the road. Glass had a fine game against a Stars team that was rolling heading into Saturday and finished with 29 saves on 31 shots. The Stars will finally feel the comforts of home against the Iowa Wild in Cedar Park on Tuesday, December 5th at 7:30 PM CST. UPDATE: The Dallas Stars have called up Curtis McKenzie to play against the Chicago Blackhawks as Antoine Roussel is dealing with the flu. No one could've reasonably expected the seven game road trip to go this well, but don't tell the Texas Stars. 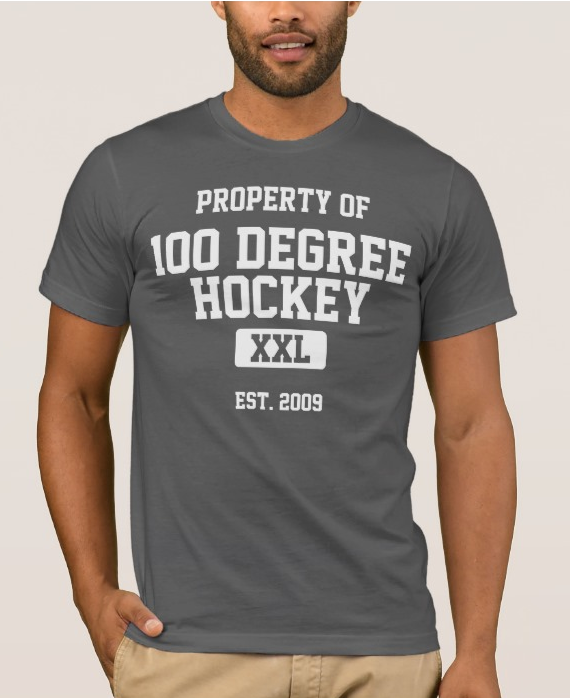 Outside of the Manitoba Moose, they are hotter than anyone in the AHL and are coming off a 5-4 shootout victory in Grand Rapids, running their current win streak to five. In that game, they had to come back from down two in the third period to send the game to overtime. 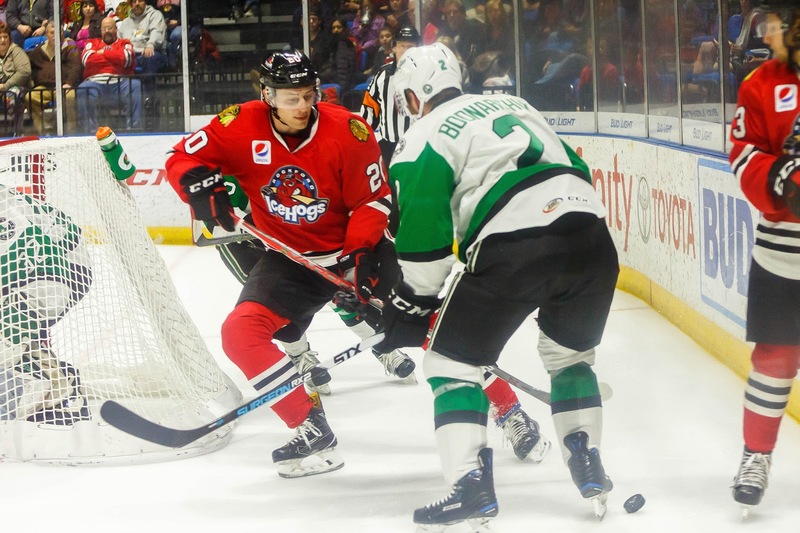 On Saturday evening, they conclude their long journey away from Cedar Park and current foray through the Central division with a match against the Rockford IceHogs. Save for the San Antonio Rampage, the IceHogs will make for perhaps the stiffest competition during this stint. They currently sit in third place in the Central division and are led in scoring by point per game player Vinnie Hinostroza. Rockford is coming off a victory of their own on Friday night against the Chicago Wolves, which took overtime. Jeff Glass got the start for them in net and finished with 32 saves on 35 shots. He will likely get the start as J-F Berube was recalled to Chicago yesterday to backup Anton Forsberg in Dallas's game against the Blackhawks tonight. Mark McNeill finally drew into the lineup against the Griffins and rewarded his team with a goal. It'll be interesting to see if he is able to go against the IceHogs, his former team. Mike McKenna had a decent night against Grand Rapids, but it could've been a strategic move to buy red hot Landon Bow some rest. The smart money would be on Bow to get the start against Rockford to finish out the road trip strong. Contributions from the usual suspects have carried the Stars through this statement making road trip. Look for Roope Hintz and Jason Dickinson to come up big and continue to help the Stars climb the standings in the Pacific. The puck drops at 6:00 PM CST. It took a shootout, but the Stars stretched their season-long winning streak to five games with a 5-4 victory in Grand Rapids this evening. Down 3-1 after the first and 4-2 after the second, Texas scored a power play goal in the third and an extra attacker goal with just six seconds left to take the game past regulation. Mark McNeill jumped into the lineup and made an impact immediately. The veteran, who had been limited to just six games before tonight, found twine off the assist of Denis Gurianov and Roope Hintz to tie things at one. Turner Elson and Tyler Bertuzzi struck before the end of the first to make it a 3-1 deficit at the buzzer. Justin Dowling and Matt Ford traded goals in the second to keep that two goal deficit in tact. The power play came to life again in the third with Hintz's seventh of the season. Down to the final few minutes, Texas pulled Mike McKenna with approximately 90 seconds left to go 6-on-5. It worked as Jason Dickinson scored his ninth of the season in the dying seconds of regulation. Overtime was scoreless and Texas was the only team to score in the shootout. Roope Hintz beat Tom McCollum, and Mike McKenna stopped all three Griffins shooters for the victory. Texas races across the midwest to play Rockford tomorrow night and end their seven-game road trip. 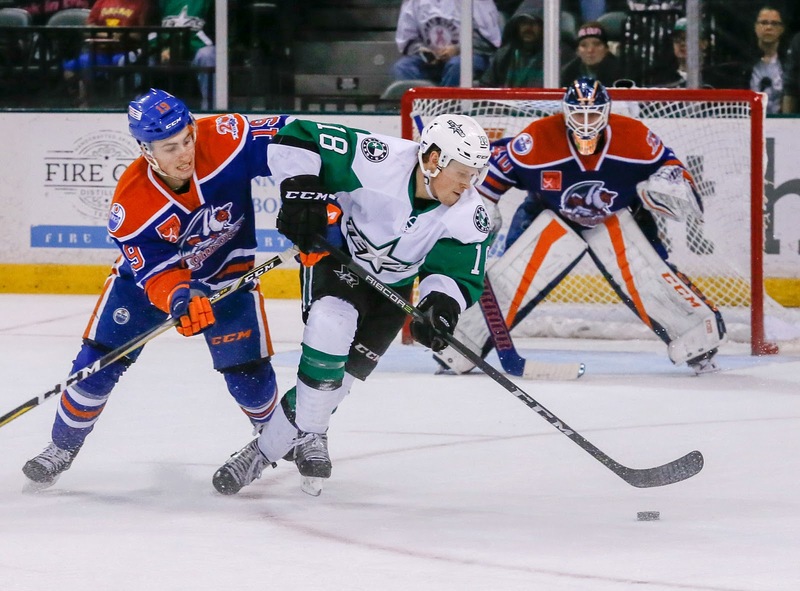 The Texas Stars are seriously rockin' and rollin' on their road trip. The trip can already be considered a success with a 4-1 record and a four-game win streak. That goes on the line tonight against the Griffins again. Let's talk about what's going well for the Stars. First of all, the goaltending has significantly improved. Landon Bow has allowed 2 or fewer goals in each of the last four games. The Stars power play is also clicking along nicely on the road with a 17.4% clip. The kill still needs improvement, but it hasn't mattered as much with the Stars scoring more consistently on their own opportunities. Curtis McKenzie has been a huge difference maker on the trip. He's scored two hat tricks and has 20 points on the season, second only behind Travis Morin at 22. Respectively, they are ranked 11th and 7th in overall scoring in the league. McKenzie's six power play goals ties him for second as well. The Stars have one game left after tonight in their road trip, a quick jaunt to Rockford. Grand Rapids also took last night off as they prepared for tonight's game. It's very strange to see a Todd Nelson coached team struggle in this league. His time with Oklahoma City showed that he is an excellent coach at this level. 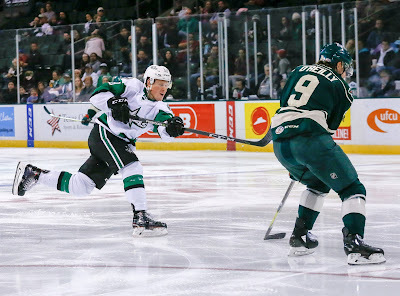 The road trip couldn't be going much better as the Texas Stars made it four in a row with a 5-2 win at Grand Rapids this evening. Curtis McKenzie scored a hat trick and Travis Morin and Max French added the other two goals to extend the Stars to four games above .500 and push them past San Antonio in the standings. They now sit 3rd overall in the Pacific, ahead of 4th place San Antonio by a game. 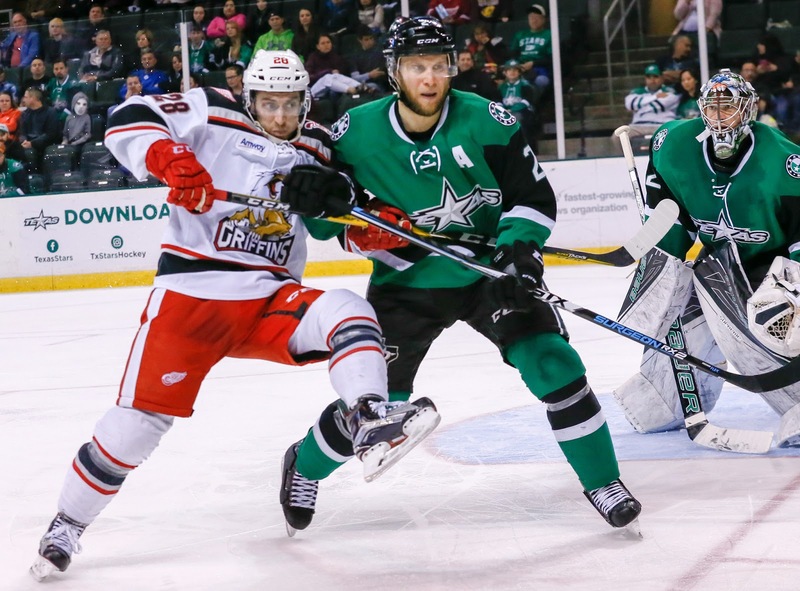 The Griffins and Stars traded goals in the first two periods. Curtis McKenzie scored just as a power play expired and once again actually on the power play to make it 2-2 after forty. The Stars opened a can in the third, though. McKenzie completed the hat trick to go up 3-2. It would be the ultimate game-winner. Max French had his third goal of the season and Travis Morin knocked in his fourth. Brian Flynn and Justin Dowling each had a goal and an assist. Landon Bow started his fifth straight game, moving to 7-3 on the season and putting his GAA at 2.44. The Stars play Grand Rapids again on Friday. The struggles of the Griffins continue as a hot Texas team rolls into town this evening. Since beating Texas 5-1 on November 11th in Cedar Park, the Griffins are 1-2-0-1. They beat San Antonio coming off the Texas win and things were looking up as they broke .500 and did so against a strong Rampage squad. Since then, they're winless with losses to Iowa, Rockford and Manitoba. Texas, meanwhile, puts a three-game win streak on the line this evening. Since the same game, the Stars are 4-1, including a 3-1 record on their current season-long road trip. Goalie Landon Bow has been a big part of that success. He's allowed only four goals in the last three games and has gotten every start for the team since the Grand Rapids loss. His numbers have continued to improve since ballooning early in the season with a bad first outing. He's shaken that off to go 6-3, 2.49 and .909. In contrast to early season prognostications, Mike McKenna may not see the net until Texas's final game of the trip, the second of a back-to-back set. It's definitely a good sign for Bow's development, but the team would certain prefer to have two strong options instead of riding a hot hand. 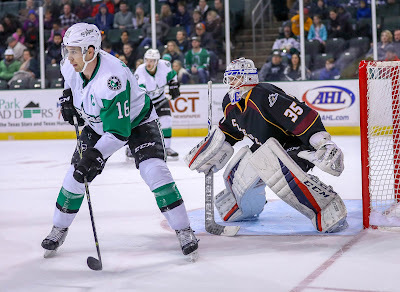 In their fourth game on this seven game road trip, the Texas Stars laced them up against the Cleveland Monsters again for the second time in two days. The Stars finished with a win in Friday's game with Roope Hintz tallying two points. They also held the Monsters to one goal in large part because of Landon Bow's strong recent play. Hoping for a repeat performance, the Texas coaching staff opted to start Bow again on the second game of a back to back. Minding the opposite crease in his second AHL game of the season was Joonas Korpisalo, who had been reassigned earlier in the day by the Columbus Blue Jackets. Bow finished the game with 21 saves on 23 shots. The Stars benefitted from balanced scoring as eight different players picked up a point. Stars rookie Samuel Laberge made some personal history by scoring his first career AHL goal which counted as the game winner. The first six minutes saw the Stars draw three penalties. First, Cleveland defenseman John Ramage committed a hooking minor. Hintz took a bullet pass from Matt Mangene and tapped the puck in the back door against Korpisalo. Later, Colin Markison had his legs taken out from under him on an interference call. During the power play, Brady Austin was called for slashing, gift-wrapping 1:48 of 5-on-3 time to the Stars. The Stars couldn't convert as Korpisalo made a couple of huge saves. The Stars weren't able to celebrate their first goal for long. Less than a minute later the Monsters had an answer. Nick Moutrey hacked at a loose puck in front of the net that found its way past Bow. It was Cleveland's second shot on goal. Markison then committed a tripping minor that gave the Monsters their first power play. The Stars killed the penalty, and the teams entered the first intermission tied at one, and tied in shots on goal with five a piece. Travis Morin committed two tripping minors in the second period. The first proved to be fruitful for the Stars as they scored their second shorthanded goal of the season. Brian Flynn and Brent Regner created a 2-on-1 on the penalty kill, and Flynn finished the play with his fifth goal of the season. The second was ten seconds into a power play for the Stars that sent play to 4-on-4. Just as the game was about to be at even strength, Mangene stepped onto the ice too soon and the Stars were penalized again. Terry Broadhurst had a good look on the Monsters' third power play, but Bow shut the door. Texas outshot Cleveland 11-7 in the period. The Monsters blitzed the Stars with a few early shots in the the third period to no avail. That was when Laberge put his fingerprints on the game with his first career goal. Max French and Dillon Heatherington recorded the assists. Cleveland committed a late delay of game penalty by erroneously clearing the puck over the boards in their own zone. Mangene was caught for tripping while on the power play, and the game went to 4-on-4 for a second time. Bow benefitted from a couple of breaks in the period as the Monsters hit a couple of posts and couldn't finish plays. That was until Miles Koules scored on redirected shot in front of the net to make the game interesting. Ultimately, they completed the sweep and made a strong statement as they continue to string together decisive road victories. The Texas Stars continue their road trip against the Grand Rapids Griffins on Wednesday, November 29th at 6:00 PM CST.